Statewide Folk Dance Festival - Folk Dance Federation of California, South, Inc. The Folk Dance Federation, South, Inc. holds a Statewide Folk Dance Festival on a bi-annual basis. 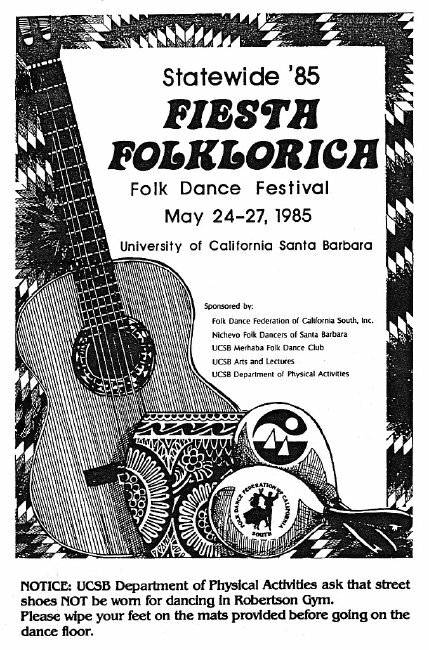 The alternate years are hosted by the Folk Dance Federation of California, Inc. (North). The 2019 Statewide Folk Dance Festival, "Ethnic Treasures" (click the Flyer above), will be held at the Edmunds Ballroom on the Pomona College Campus, 170 E. 6th St., Claremont, CA 91711, on May 31st to June 2nd. Instruction and parties will take place in the beautiful Ballroom, which is located in the Smith Campus Center of Pomona College in Claremont. Use the PRERIGISTRATION form below or for ONLINE registration choose BROWN PAPER TICKETS. Click DOUBLETREE HILTON, our host hotel in Claremont, to reserve your room at the festival price. Conveniently, Ontario International Airport is only 11 miles from the Doubletree Hilton in Claremont. Whether arrival is by airplane, bicycle, stage coach, or Chevy Volt, the Folkdance Federation of California, South, welcomes NFO members to Statewide 2019! There will be cameo teaching appearances by Sevi Bayraktar, Mihai David, Petur Iliev, and Israel Yakovee, plus Sunday Salsa Rueda with Cesar Garfiaz. Music this year will be provided by Maimon Miller and Friends! NOTE: Minors under the age of 18 whose parents are not attending "Ethnic Treasures" festival must carry a signed medical authorization, as per Pomona College policy. We love youth! No entrance fee for young folks. Bring your children or grandchildren! Just download the form below and have it signed in advance. Need more info? Click Statewide or call 949-675-2199. For an interesting look at past Statewide festivals, click Statewide: 42 Years and Counting. Larry Getchel wrote them and they include scans of program covers and information about each festival from 1946 through 1987.